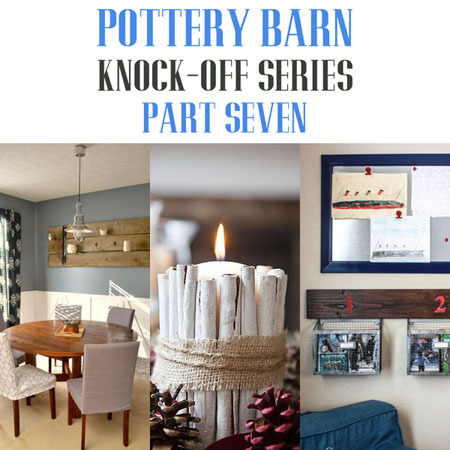 Well before we start featuring a potpourri of Holiday Creations…we though that we would sneak in one more Home Decor Pottery Barn Knock-Off Series! 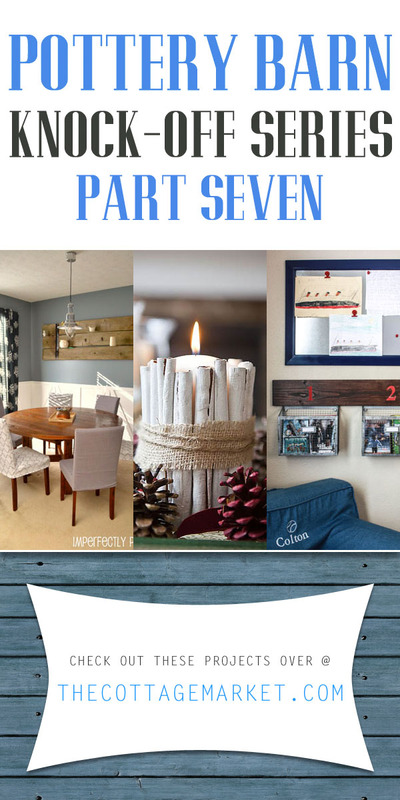 This one is actually Part Seven and it is filled with wonderful DIY Projects that you will want to adapt to your home decor and style. You are going to find quick and easy projects like a Mercury Glass Cloche that is simply gorgeous…Wood and Wire Hanging Baskets that are a fabulous way of achieving that organization you strive for…a DIY Curvy table that looks like it walked out the front door of Pottery Barn…then there is a Tufted Headboard that is no short of SPECTACULAR!!!! Then of course there are more wonderful creations that you will experience and want to create for your very own. Each one of these DIY’s come with a spot on picture perfect tutorial that will make creating so very easy! So sit back…enjoy a cuppa of something yummy…relax and Enjoy! If you are still in the mood for more Pottery Barn Knock-Offs…just click here! Didn’t you just love the Tuscan Vase and how about the Numbered Chair! I just can’t choose a favorite…they are all fabulous! As always here at The Cottage Market we would like to send tons of APPAWS and APPLAUSE to all of our blogger friends for sharing their talents and creativity each and every day! We want them all to know how much they are loved and appreciated! You are going to adore exploring their blogs! Well now all that is left to do is to ENJOY & CREATE!!! I’m learning to use my new jig saw for the November Home Depot Do it Herself Workshop project…loved the hertoolbelt.com table project. Putting that on my “have to try” list…which is getting longer by the day. Thanks, Andrea. Thank you for featuring my vase tutorial. This is a really good roundup of projects! Thank you so much for posting my wall baskets! You are so kind, and I am excited to have found your blog… I’m loving what I’ve seen so far… I’ve gotta go look around some more!!! Thanks again!